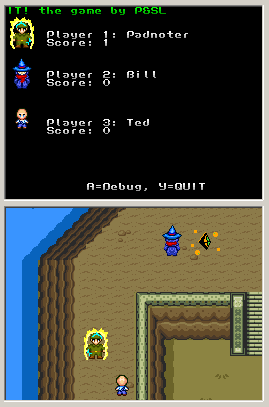 IT the game is a multi player/large map homebrew game developed using devkitpro/PAlib. The idea of the game is based around the children's game of "IT" or "Tag". The player who is "IT" will be highlighted in fire. They then have to find another player and touch them to tag/it them. That player then becomes on "IT". Points are lost when you are tagged. Points can also be gained by picking up the treasure on the map. It should be loaded on 2 or 3 DSs. 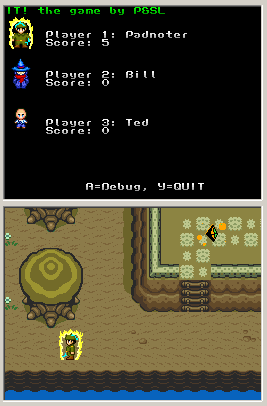 As each DS runs the game, it will automatically connect with the other players. It can be played on a single DS, but there will be no one else to tag.... just treasure to collect & the map to explore. It! The Game 0.4 Beta NEWEST!